Goals are one of the most important things you can establish in your Google Analytics account, but you also need to understand what you’re looking at, so that you don’t jump to the wrong conclusions. How are our Google AdWords campaigns performing in getting people to come to our ecommerce store to buy our clothes? How does adding an extra page in our checkout funnel affect overall conversion? These are all things that goals can help answer. There’s a lot of confusion around Goals and Funnels, so I hope to answer some common questions here, provide some (not so great) workarounds, and end with my recommendation for Google. Let’s use an example an ecommerce website which has three store sections (men’s clothes, women’s clothes, and children’s clothes). 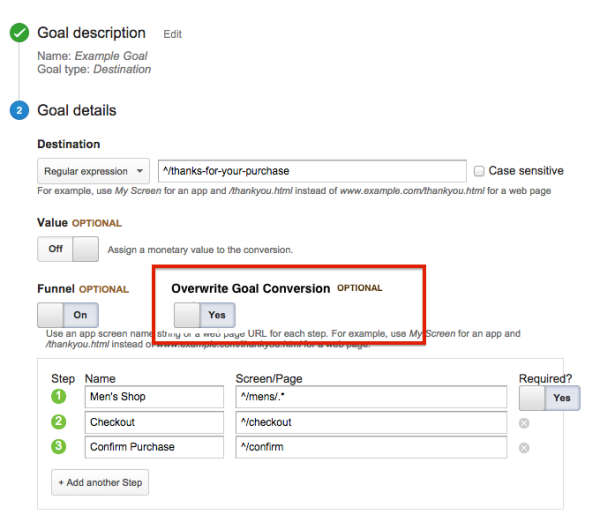 When you set up a URL Destination goal, such as a purchase confirmation page, that’s the page that will generate how many times that goal was complete. Maybe for our ecommerce website we’ll set up three different goals with three different funnels, one starting with a required step on the Men’s store, and one with a required step on the Women’s store, etc… Yet when we look at the Goal Conversion Rate or the Completions they will all be identical. That’s because on our site we have a single page (/thanks-for-your-purchase) which every purchase finishes on. The funnel itself, even though we’ve clicked the first step being required, doesn’t matter at all to the goal completion itself. All that matters is “Did the user hit the URL Destination page listed?” That’s it. Are you able to pass information breaking up your conversions to the final conversion page? Maybe you can put a parameter on the URL that makes /purchase-complete?shop=mens different from /purchase-complete?shop=womens? If so, you’ll be able to create specific goals based on those parameters, and see different goal conversion rates for your men’s, women’s, and children’s shops. You could even pass a variety of information and create different goals based on the product itself. This breaks down pretty quickly unfortunately. It remains session based, so what if someone visited the men’s store, and then purchased from the women’s store? Would that get passed on? What if they’re not buying one product, but multiple? What if you have multiple portals that sell men’s gear, and want to distinguish them? Suddenly you have a slew of parameters that effectively become the user’s session history of every page they hit, and that’s just not an effective solution. If you’re doing something simple, the workaround probably works. Start adding complexity and you are back to square one. Alternatively, you could set a custom dimension in Universal Analytics on specific pages, and have them be session based. So if someone hits the children’s portal, you set a session level custom dimension for “children’s” and then have a view that filters for JUST that value in the custom dimension. Then when you duplicate the goal within the view, you’ll be seeing only conversions with that specific custom dimension value. What happens when someone hits the women’s portal page next, does it use a second custom dimension, or overwrite the one you’re using? If you have a small site, you could get away with this, but otherwise you’ll quickly run out of custom dimensions that could be used for much better things. Or maybe you have multiple ways into the funnel, and skip those pages entirely. Once again, if you have a very simple site, you can probably make it work, but it breaks down under complexity. 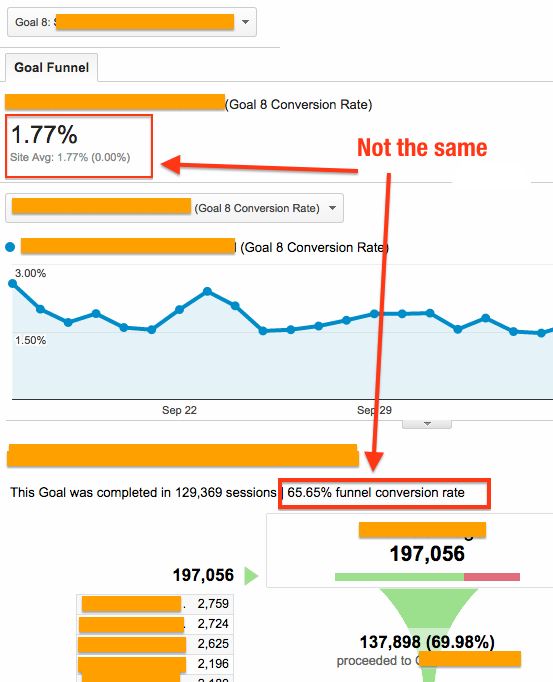 So the goal completions are the same, but those aren’t the Funnel Conversion Rate. The Funnel Conversion Rate can be found inside the Funnel Visualization report page under Conversions>Goals. There you can see how many times the goal was completed along with that Funnel Conversion Rate. The Goal Conversion Rate is tied simply to the final URL Destination, and doesn’t care about the funnel. The Funnel Conversion Rate is JUST the percentage of people who completed the goal who entered the goal somewhere. If someone didn’t ever touch any of those steps, they’re not counted. This is partly what leads to the funnel conversion rates being so much higher than goal rates. The goal might have a 0.5% conversion rate, but the funnel conversion rate might be 50%. The funnel conversion rate is what it is. It’s just important to understand that it’s NOT a goal conversion rate that includes the funnel, but something specific to the number of people who entered that funnel, rather than the total number of people who hit the website. It’s a good metric, even if we can’t access it ANYWHERE but on the funnel visualization. Hey but at least we know that people hit all those steps in the funnel right? Sadly no. Ever see a funnel that has 100% of the people moving through several steps along the way? One reason might be because these numbers are “backfilled”. The first step is required, so if Google Analytics sees you hitting a later step, it will assume you hit those earlier funnel steps. It then fills in the numbers for the previous steps assuming that there was some error that caused them to not see those hits. So did 100% of the people really see that personal information page and pass through to the credit card processing page? Or did nobody? The Funnel numbers themselves can be lying to you. For more information how this works, refer back to some of our previous articles: Funnel Problems in Google Analytics or Google Analytics Goal Flow: How Visitors Really Move Through Your Funnel. Like #2 there’s not much we can do here, besides be aware of it. Probably the best thing we can do is use this knowledge to be very careful about how we construct our goals, and if we see weird things like 100% users passing through several stages, we might want to look at editing the goal, or checking the actual user flow on the page, to confirm that things are working. Just don’t ever assume that the numbers are 100% accurate. Are you interested in just looking at how the organic traffic is performing in your funnels, rather than all traffic? Well, unfortunately, you can’t use segments in the Funnel Visualization. If you have a Custom Segment applied while looking at one report, you might get confused when you switch over to the Funnel Visualization and lose the ability to segment. So let’s say you really wanted to look at only sessions where a visitor saw that new banner with the manatee wearing a suit picture on the home page. Sorry, that segment won’t work, and you are forced to look at 100% of the traffic to that view in the funnel. The best thing you can do here is leverage your views. If you want to see your goal funnels for just organic traffic, then you should create an organic traffic view, and share your goal within it. That way the funnel visualization and conversion rate within the organic view will show just those goal and funnel conversion rates for that segment. If you are doing something like firing an event on your home page manatee banner image, and have been segmenting based on that, you’ll need to change how it’s handled. You could use a similar custom dimension session scope solution like with the first confusing thing, but that leads to the additional problems listed above like running out of custom dimensions. In addition, views are only populated going forward. Want to know what your organic funnel conversion rate was last month? Well this solution won’t help you. You’re just not going to get that number easily. My proposal to help solve some of these problems is basically to have Google Analytics create a Goal Override on the Goal itself. A toggle which lets the Goal Conversion Rate be affected by the funnel itself. Instead of reporting on the percentage of people who visited the WEBSITE who hit the URL Destination page, it would be the percentage of the total visitors who hit all the REQUIRED STEPS in the FUNNEL and also hit the URL Destination Page. This way your Goals could be much more specific to a pattern of activity, rather than a single event. I would like to be able to set a toggle on each step in a funnel, which would define that step as required, optional, or disallowed. If the step is optional, no need to forcibly backfill it. If the step is required, and a person doesn’t hit that step, they don’t convert the goal. If the step is disallowed, and they hit that step, then they don’t convert that goal. 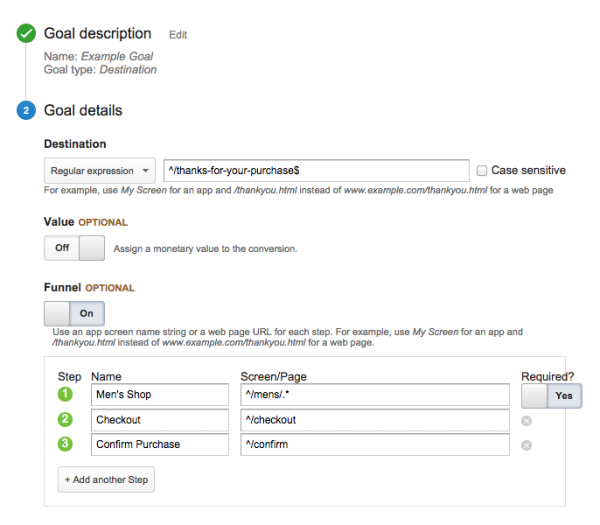 An example would be a funnel where you want to look at the conversion rate of those that were brand new customers, so you want to require the new account creation page, meanwhile in another goal for existing users you want to DISALLOW that page, so if someone hits the new account creation page, it should be left out of the goal. I would like to segment goals within the Goal setup itself. For instance I would like to be able to go into an essentially unfiltered view, and create a goal and as part of the goal define that the Source/Medium needs to be google/organic. That way I could create a “Google Organic Conversions” goal in a view, without necessarily having that view be ONLY Google Organic visitors. It would simply only restrict the conversion on that goal to the person’s source/medium (or other dimensions like say Country or Region, or multiple variations) rather than simple behavior. Goals and Funnels can have confusing aspects, and when you really dig into them they sometimes can’t do what you want them to do. There are potential workarounds, but nothing that is perfect. 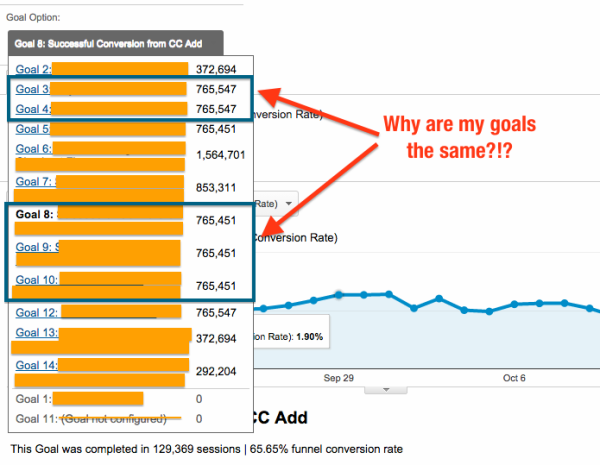 I have few proposals for how Google Analytics could improve Goals and the Goal Funnels, but I’m sure I’m not the only one. If you’ve got a great workaround or suggestion for how to fix some of these common issues, leave them in the comments!